King James VI and I's extensive publications and the responses they met played a key role in the literary culture of Jacobean England. 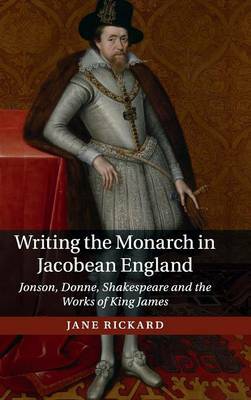 This book is the first sustained study of how James's subjects commented upon, appropriated and reworked these royal writings. Jane Rickard highlights the vitality of such responses across genres - including poetry, court masque, sermon, polemic and drama - and in the different media of performance, manuscript and print. The book focuses in particular on Jonson, Donne and Shakespeare, arguing that these major authors responded in illuminatingly contrasting ways to James's claims as an author-king, made especially creative uses of the opportunities that his publications afforded and helped to inspire some of what the King in turn wrote. Their literary responses reveal that royal writing enabled a significant reimagining of the relationship between ruler and ruled. This volume will interest researchers and advanced students of Renaissance literature and history.